I don’t drive. It’s not that I can’t drive, mind you, it’s just that I prefer not to, and it’s from that angle that I approach a driving game like Forza Horizon 4. It’s a sleek, well-oiled machine that brings cars and players together in new ways, but the real test, for me at least, is “does it make me think about maybe wanting to drive?” It does. By my own personal metric of driving game evaluation, it is a success. The past two driving games that I enjoyed were Dirt Rally, which I sunk a weird amount of hours into earlier this year, and Need For Speed Underground 2, which I became obsessed with in a (frankly unhealthy) way back in 2004. After getting deep into Forza Horizon 4 since its release earlier this month, I have to tell you that it is the perfect middle ground between those two games, as if someone read my exact mind to create a racing game. Horizon 4 jams players into a Scottish open world and asks them to toot around and do races. There’s some hide and seek shenanigans, like finding hidden barns in the world, but the majority of the game is just about racing around in different weather and seasonal conditions and trying to get first place. Like the Dirt games, it is no nonsense, and if you want to race in an accessible game format, then this is a game for you. 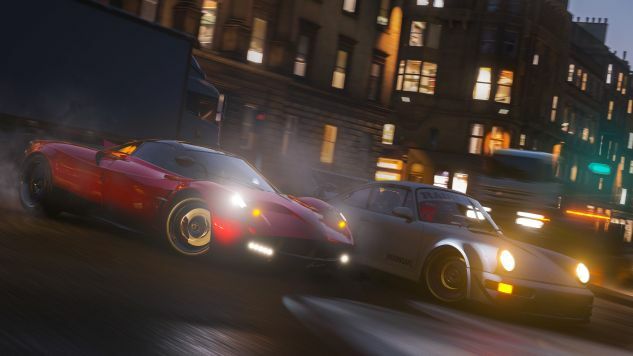 Like Underground 2, though, Horizon 4 has a lot of cars, customization options, and skills that you can unlock. It wants you to buy the cars of your dreams and make them into the aesthetic objects that you want, although sadly the game does not have the degree of specific body modification (and under-car light additions) that the Underground games were so good for. However, you can buy a trash car from the 1960s and completely cover it in wood paneling, so there is still room for true uniqueness in the racing experience. I say all of this as praise. I am not a racing game aficionado, and to some degree that makes me a very honest critic when it comes to these types of games. As I said at the top, I don’t even like driving real cars. I have none of that American open road fantasy about me. So a game that can bridge all of these basic realities of my life and make me care about a car game is, in my mind, at least interesting. Forza Horizon 4 does that work. It makes me think about how following the right line and accelerating and braking at certain moments impacts the long duration of a race. It makes me care about road conditions, for God’s sake, and it does so in a way where I don’t have to be bogged down in simulation-y minutiae. To me, that’s impressive game design, and I applaud the bridge-building work that the developers of Horizon 4 have done to make someone who is a relative outsider to both this genre and enthusiasm about cars feel welcome. At the same time, it is precisely this open-arms, everyone-is-welcome design that fundamentally made me bounce off the game. Or, rather, it made me slide off its polished exterior. Despite moving from race to race and season to season, despite buying new cars and skilling up my vehicles, I never felt like I had moved very far from square one. Maybe this is my deeper misalignment with real car culture and racing games; I don’t know where I am supposed to go after I have done a decent job of learning the ropes of driving and racing successfully. There is only so much thrill in going around a course or hitting a road at maximum speed. There are a finite number of cars that I am interested in owning and puttering around it. I assume that the path forward is trying to get better. It must be about bettering yourself as a driver and a racer. It must be about perfecting, down to the centimeter, how to take a banked corner when it is raining. And I guess, for some people, that might be the carrot that keeps them moving on. But when I reached that point in Horizon 4 after a couple dozen hours, I didn’t have the drive to keep going and pursuing new paths. If you do, it is probably a game that will get its hooks in you like Need For Speed Underground 2 did me all those years ago. Forza Horizon 4 was developed by Playground Games and published by Microsoft Soft. Our review is based on the Xbox One version. It is also available for PC.